In this last post of our blog series on the humanitarian use of drones we look at two closely related issues that call into question the current use of armed drones and raise a serious point of discussion for the humanitarian use of this technology. These two issues are transparency and accountability. Transparency refers to the open development, acquisition, and use of drones; accountability refers to drone users being investigated and held to account under international law when there is reasonable grounds to believe they have contravened this law. Only three states currently operate armed drones: the US, the UK, and Israel. So far, none of these states has been willing to release their statistics for civilian deaths caused by drone strikes. How they respond to this renewed call for transparency remains to be seen, and will set the stage for further development on the accountability issue — how to proceed against states that have used armed drones in contravention of international law. Where does that leave the potential use of drones for humanitarian purposes, particularly information gathering to support atrocity prevention? A fundamental principle of human rights law is that violators of this law must be held to account. Humanitarian use of drones to monitor existing and impending human rights violations, including genocide, would support the realization of this principle. However, a host of questions then arises related to transparency and accountability. Must humanitarian use of drones comply with the imperative of transparency being demanded for the use of armed drones? 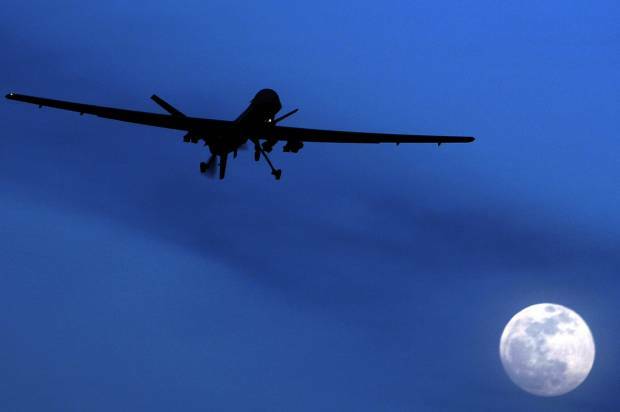 If a humanitarian agency acquires a drone, should this information be made public? If the agency intends to deploy a drone in a humanitarian hotspot for the purpose of gathering information, should this activity be made public? Or is a measure of secrecy necessary to the most effective use of these drones? In a nutshell, should the humanitarian use of drones be subject to the same transparency requirements as the use of armed drones, or does the humanitarian end to which the drones are deployed override the need for transparency? Who makes this decision? Secondly, in his special report, Heyns argues that permission for a state to use force (e.g. deploy armed drones) in another state’s territory can only be granted by the target state’s highest authority (e.g. government) and not by lower authorities (e.g. military or security groups). Must a humanitarian group also secure a state’s permission to deploy an information-gathering drone in their territory if no force is to be used? And when a state is the aggressor in the humanitarian issue, how likely would they be to grant such permission? If information can be gathered, will it be used to support accusations of war crimes or crimes against humanity and, if so, how would this use affect the work of humanitarian organizations in the target country in the future? Would they be seen as neutral or perceived as Western spies? Would their ground operations be compromised and the safety of their workers jeopardized? Finally, related to accountability, to whom must humanitarian groups answer if they invade a sovereign state’s territory for the purpose of monitoring humanitarian or human rights crises? And if an information-gathering drone were to go off course and injure or kill people, in what sense must the humanitarian group be held responsible for this error? Currently, no humanitarian group has publicly acquired or deployed a “peaceable” drone. However, once drones come down in price and their technology (size, capabilities, efficiency) improves, humanitarian drones may become mainstream. Before that day comes, a governance framework and international regulatory system needs to be created which separates military from humanitarian uses and adequately addresses the four key issues of accountability (including transparency), privacy, safety, and sovereignty. Emersson, Ben. Promotion and protection of human rights and fundamental freedoms while countering terrorism. U.N. Report A/68/389. Heyns, Christof. Report of the Special Rapporteur on extrajudicial, summary or arbitrary executions. U.N. Report A/68/382.